In my work, I am often asked about subjects that are assumed to be generally accepted within my profession. As a result, I frequently find myself explaining that, despite the stereotypes, my peers really are a diverse group of people — all with different opinions. When I am asked about soulmates, many are shocked to find that not only do I not believe in the term, I actually find the entire notion dangerous to those who honestly seek evolution within themselves or any sort of sexual enlightenment. For one thing, the term itself has no universal definition. (If you check the blog, you’ll see a multitude of descriptions and explanations of soulmates.) The word seems to alter in meaning as each new person postulates on the general idea of what one is, or isn’t. The descriptions are fluffed up ideals that can take us away from the realities of relationships and the true nature of love — that love doesn’t always last forever and that love can hurt. People embrace the soulmate theory as they do any idealism — as a distraction from the possibility of hurt, and as a way to simplify relationships. When they start dating someone, they want to believe that this person is their soulmate, so that the relationship will somehow be easy and free from disruption. People believe they are entitled to have a soulmate and that they don’t have to struggle to make a relationship work, or to even find a relationship … they think that the love of their life is just around the corner because it’s fated. They can also be very hard on their partners when they don’t act like their definition of a soulmate. People stop looking at the person they are in a relationship with for whom they really are, seeking instead to find out whether or not they fit into their formula of what a soulmate should be. These are all recipes for disaster. 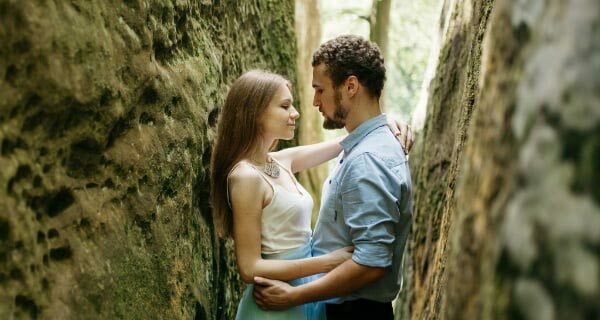 Finding a mate in this way encourages people to divorce themselves from nature — and in truth, love and relationships rely on the subtle and powerful forces of nature, biology, and chemistry to bring us together. There is also a large mystical component to it that is absolutely inexplicable — we can’t always put in words why we are with our mate, why we love our mate, or how they make us feel. And, of course, there is romance, too. Relying instead on the soulmate ideal, which seems to promise easy success, actually robs us of our drive to find the right mate for the right time. It pulls us away from the garden of tenderness and lust, which is our true birthright. The “fluff” you mention about the kind of soul-mate relationship that is perfect and harmonious and lasts forever is rare BUT it does in fact, exist. Just because it is a soulmate relationship does not mean its a romantic one! and most soulmate relationships tend to NOT last. The purpose of a soulmate relationship is NOT about fulfilling your life, making you happy and content and live on cloud nine (that is something you have to do for yourself, which will result in you finding your soulmate quicker by the way) a soulmate relationship is designed to help you LEARN lessons that you need to learn, and I will tell you what, you may not like learning those lessons, but it is necessary. which brings me to my disagreement to your theory how its “dangerous to those who honestly seek evolution within themselves or any sort of sexual enlightenment.” …. It damn well sure is bud 🙂 a soulmate relationship will speed up the lessons you are to learn on this plane of existence so that we may ascend and evolve to the next level. I agree Verbana and what a wonderful article. I spent many years alone in the past bitter, looking for a soul-mate or the right one. Now I get to know, who seems to have mutual attraction and communication. It seems I can have feelings of love for more then one at time. It seems that a relationship is some form of a committment of honesty and respect with the one who is best suited for what he or myself wants at the time. Now I have more satisfying dating relationships and friendships, getting to know men for themselves and worrying about their finances, looks, ect. Finding relationships not ending with bad feelings and it’t nice to care, even if the relationship doesn’t work out. This was an article written with conviction and realism. The forces of nature are not always smooth and this in not a negative thing. Love is not always an instant connection and true lasting love is not without differences and challenges. Lasting love is respecting the diversity of self and those we choose to hold close to our hearts. Phew!!! That is quite a bit of insight & respectful in all responses, many to the point. I have often pondered, especially in the past few years, what a soul mate really was. This article and its responses certainly gives one choices to best define it on a personal level. Thanks to all & to Liam for lighting a fire! I’m doing well…..and yes, I had a great Imbolc. Your articles make people stop and think ……keep on writing. All of the difficulties have taught me so much, and although I am wise to the ways of love, it doesn’t mean it always goes well for me. I’m still waiting to find love, just like so many others. But in the meantime, I count myself blessed to have many friends and family to love and be loved by. I truly believe that if all we do in this life is love and be loved, then we have accomplished great things. Liam, Thanks a million for responding. I am looking forward to the next Selected topic/big idea of yours. You do a great job in creating deep discussions/debates…. I love the olympics…We turn the volume off, use CC/ and put on musical CD’s and watch. Still not used to the Bruins being so low in Basketball. I always think of you when the Cav’s play…Happy Day. I didn’t realize this was a blog as well as a newsletter article. I sent feedback through CP and would like to share here too… can’t believe I missed it! Outstanding! Outstanding! Outstanding article! What you have said here, Liam is very close to what I say many times per day on the line. I will be referring my clients to this article, as I have others. I love the stories I hear from the era of our grandmothers like Miss Krystal shared. I feel the soul mate theories were most appropriately experienced in that time. But even then, and as much as my grandparents loved each other, they would always say that “marriage is a lot of work.” People stayed together then. I feel today, in the traditional context of lifetimes, we are actually experiencing more than one lifetime within our lifetime… and very rarely is there a “forever love.” Truly love hurts. I really appreciate and resonate to your no-nonsense and no-frills expression of relationships; not just this article, but others too. Rarely do I encounter a fellow psychic and/or spiritualist with anything close to my perspective. That kind of truth does not speak to instant gratification, and therefore risks popularity in the moment, but real deep healing always comes to fruition over time… which, is truly in our client’s best interest. Liam, I feel that you really demonstrate an authentic commitment to consciousness, truth, and integrity. I share that commitment, and from my experience, it is painfully rare. Love is much more than the typical and various soul mate theories. I think relationships are not easy, and romantic love absolutely provokes some dark sides of the human condition… like possessiveness, inner insecurities, jealousy, and the entitlement Liam spoke of. I feel it would be irresponsible of me as a psychic/spiritual reader to ignore these very things we are here to transcend for our own evolution, in and through love and relationships. I appreciate you, Liam and others who write from a place of experience in life. We don’t have magic wands and most of the time there aren’t easy or mystical answers to these very real issues our clients face. I feel these kind of articles prepare clients for deep psychic healing; because the substance of truth these articles speak of, provokes the thought process that opens a person’s mind to real answers that are not easy, shifting a reading into consciousness and leaving a client empowered to effect positive change. Crazy as it may sound, in reading your articles, I feel less alone in my work and my perspective. Once and a while I have days that are a bit challenging because an unusual number of people want a magical fairy tale that don’t exist. I was so grateful to see your article with responsible, intelligent, and real answers to love and the soul mate myth on our website. I feel a sense of belonging to a group committed to helping some shift into a new way of life… even though I work alone. Be it small in the big picture of things, it is huge to me. Please keep writing and posting. I love the diversity here… and that we can all share lovingly even when we disagree. Thank you California Psychics! Greetings, Miss Krystal. I do hope that you are well. It is certainly an exciting thing indeed to see all of this response to the article. I’ve been having a fine time reading all of the different points of view and opinions on the matter. My burning question for you, though, right now, is, did you catch that hockey game yesterday? U.S. defeated Switzerland? Too cool. Are we ready to watch the lads face Finland on Friday? Hard game, and it will rock. Be well. Greetings, Gina Rose! Hey, pal, did you have a good Imbolc? Been thinking of ya. Thanks for sharing all your cool insights. You are a very old soul, Corrine. Ahead of your time-I would love to meet you, where were you for the xmas party? I am happy for you with your marriage. It’s obvious that you are a medium. I know you will help many people in your lifetime. LD-Thanks!! I like in many ways how you have received this discussion in here. Let’s hear it for the professor for her summary! Excellent. We have the liberty to believe what we want. What we truly believe in our soul, our minds, spirit and true essence, is purely up to us, as individuals. And just like an education, nobody can take that away from us! And please recall, we can always “change” our minds, later….As many humans do…..That is just life. Experiences can do that…Never say never….Love has a way of showing up at the strangest moments…. A true teacher that you are…Your students are so lucky to have you!! We don’t have call anyone a soul mate to prove that they have affected us in some way. Every relationship, just as every event that we go through, no matter how wonderful or traumatic, can change our course in life. We will be more profoundly affected by some and learn far more in different periods of life. Call them soul mates, call them karmic connections, call them lessons…regardless of the word we use, they are real and they are many. No relationship will survive if we lock ourselves and the other person into such a defined role. There is no one that can bear the weight of the universe on his or her back. We can not be everything to anyone, nor the other way around. Just as Shakespeare shows us through the lives and deaths of Romeo and Juliet, we must let go of what we limit ourselves and others to be and only love for what is truly there to be learned. They learned that they could love each other for who they were and despite who they were supposed to be. Thankfully, most of us have love lives far less tragic. Call it what you will, but really it comes down to one thing…Love. You give it, you get it, you let it go, you get it back. It doesn’t always come from the same people in your life, but it is always a blessing. Love everyone for what they bring to you, good or bad, and give back what you can. There is always a lesson to be learned, the greatest of which is to believe in love. I do believe and agree with those of you who have mentioned that “one and only one soulmate” is too limited a vision and not correct. I do agree with those of you who have mentioned different soulmates available at different times or stages in our lives. And Liam, I do agree that the term “soulmate” has been overused and does seem to tend to have people thinking their “soulmate” means there will be no work or effort required to build and sustain the relationship—a “soulmate” means everything will be perfect right from the meeting of the two people. Please. “Is he/she my soulmate?”, i.e., can I relax and stop putting effort into my relationship? And, “not always able to say why we love our partner”…. beautiful. I do believe there are aspects about our love for our partner we can identify, but the totality of it can sometimes defy explanation and frequently doesn’t quite fit any pre-conceived notion we may have had about who would fit into our lives or how. But, then, isn’t that part of why love is grand? Thanks again for a great article, Liam, and for all of the very thoughtful responses from all of you here. Above all, the most important thing is to believe in Love and feeling good! I hope everybody does. You have come such a long way, in a short amount of time….I am very proud of you. Not to get off track, but this reminded me of a question a client just asked me last week. The question was : Are there souls walking the earth who are not meant to be with a ” soul mate ” ?, or destined to never find a ” soul mate ” ? There are souls, so old and evolved, nearing their final incarnation, that they are here to serve a higher purpose, for example….the Pope, Nuns, the Dalai Lama, …people like Mother Theresa…etc….you get the picture. First and foremost….we incarnate, ( as an individual WHOLE unique soul I might add ), to walk our individual Karmic soul life path…. as such,we will encounter many, many types of Karmic connections to help us grow and evolve. But nobody makes us a ” whole soul or entity”. The notion that another soul completes you is usually a dangerous prelude in stunting your own Karmic growth. We enter into this incarnation and exit this incarnation as a whole individual soul entity. Yes, as I teach my students, souls only come together on the earthly plane to help each other learn life lessons so important to continued Karmic growth. I agree…..you are a very wise, old soul. I commented below, but I wanted to post to you directly as I was impressed with your point. As a career psychic of 44 years, if you stand back and look at the WHOLE picture, all souls walking the earth are spiritually linked, soul to soul. All of mankind are soulmates…and,if all of mankind believed that we would have world peace!…but only in a perfect world. ….there are different types of Karmic connections…..but the ” one and only soul-mate ” theory is a dangerous myth. In response to all comments, here are my thoughts. Being a spiritual person who has had true complete visions of things to come and have sensed the connection between the creator and the creation I must say we are meant to be a wonderfully inperfect being with a complete soul. If any one feels incomplete it is usually due to the damages sustained in this imperfect worldy sphere we are all co-habitating in. But since we all come from the creator of course these “Soul Mate” bonds will be detected by individuals who are spiritually aware of their existance in the universe. I see this as icing on the cake when one comes across another soul tie and usually there is a lesson to be learned or completed by these connections. Always rememeber we come from the same lifeforce so it is no wonder that there are bonds between us. God bless all! Your clarification is much appreciated. Sending lots of love & a big smile your way. I had to re-read this article twice to make sure I digested the content of it properly before I commented. Miss Krystal eloquently wrote much of my feelings on this topic of discussion. I have seen way to much to not believe in the Soul Ties, Karmic Ties, Soul Mates. As a past life regression therapist I’ve even been exposed to some things that there is just no explanation for other than Soul Ties / Soul Mates. I agree that not every person you feel attracted to or are enamored with is a soul mate. For that matter is it not the same when people say they are looking for the one? What is the one? In my experience they Soul Ties / Soul Mates exist. We should not stay in painful relationships or have unrealistic fantasies of what a mate is that we get lost in life. Not every relationship we have is a soul mate connection. When you find one trust me you will know it. We live in a very spiritual world…And love is also, spiritual…It can be timeless, too…. Thanks, Corrine. Yes, we are most definitely the same here on this issue. Thanks for picking up on grandpa. He is a strong spirit…I will tell granny what you feel, too. Actually, granny and grandpa had a lot of similar things that you and your hubby had-granny met grandpa when she was 19, married him at 20, and he was 22… Thanks again. Remember our conversations…..I never, ever, use the words ” soulmate ” or ” twin flame ” when I read for clients , or when I train psychics. ” soulmate ” was used too generically and way too loosely. Those two words span a very broad spectrum. ( something I learned when I crossed over twice to the other side by the way). When next I read for you, remind me to go into more detail and I will explain further…. ..as I teach my students about Karma,and the different types of Karmic connections…of which there are way too many to go into here. A Karmic connection is a window of opportunity for growth…..for BOTH, or all, souls involved. You are a beautiful writer, I always enjoy reading your articles. When I read your writings, a peace seems to come to my spirit. And, for what it’s worth, a truth also resonated in my spirit as I read your article. Liam, I am gonna have to beg to differ here- With all due respect–no hard feelings, and I hope you understand that I am going to express here what I truly believe….In my experience…Thanks..
We can’t argue someone’s experience…If someone has experienced something, then, in their own observation, it’s a truth-at least for themself….And on a personal and spiritual level, I feel there is a thing for sure, called, “the soul connection”-a cosmic connection….We can have it with people, places, things, pets etc…. However, I do believe there are many people on this planet that could be good for us. It is the choices we make, that of course set the conditions…Most of the time…But it’s the divine times, that bring us those “Soul Ties” and it is up to us, to decide just what we want to do about these cosmic connections. As they evolve.. So, “Soul Mate” is open for interpretation…I know it’s true in my life. For the wonderful people I have met, at the strangest times and moments, that have been so dear to me…Even when they have let me down, at times, there is just something supernatural, that makes these “karmic ties” splendid and everlasting…Whether in spirit or in physical, how many of us out there have had moments when we realized that we could have fixed a broken relationship? But the karmic window closed…..It’s the choices we make…And who is to say that the karmic window will not open again? It could….And that is where a reading can help….Or to hold on to your present soul tie….We as readers can help.. I don’t think you are wrong at all…nor do I think Liam is ‘wrong’…In fact I think he has taken a very brave and enlightened stance giving us all a dose of much needed reality and respect for the enormity of what we actually are. You, Believer, are very correct…we have many soul mates…We have a whole world full of soul mates and I think Liam’s point was exactly that…Every person on this planet is a soul mate…We share our incarnations with billons of spiritual siblings, each one holding the potential to help or hinder our growth as we may help or hinder theirs along the way…Unfortunately as Liam so wisely points out we have taken that concept and narrowed it…shutting out the energy level connection we have to all our spirtual siblings in favor of the search for that one ‘perfect’ match…one soul completing mate…All in the hope I think that if they are the only one mate for us…then we are the only mate for them and thus have no reason to fear rejection or loss…But to do this makes us so much smaller than we are…so much less than we are meant to be…and I think Liam is a wise enough soul to know it. Liam – this really is a wonderful profound piece of writing. I totally agree with you on this. I really do feel there is much misunderstanding about the term Soulmate and just the word alone has been misunderstood and over used. Yes many of us are lonely, feel unloved and looking for answers. You yourself clarified a question on my male friend. I already knew what you were going to say – no, I was not disbelieving my own intuition; I just needed a bit more time to distil the information around me and the pointers you added gave me the clarity to do so. Whilst there is common misunderstanding about soul mates, I truly do believe we come to each other for lessons to be learned. It is very true as you state that people stop looking at the person they are in a relationship with for whom they really are – and trying to fit them into soulmate box themselves. I know the man I am very found of has mega issues to deal with, yes he is fond of me, but not in the way I would like him to be, but I still care about him. I accept he is with another, yes it hurts like hell – but I know his issues would greatly hurt me if we were together, so as mates we are strong, as lovers it would not last (the Universe is protecting me). To me that’s where the word “mates” comes in.. we do care about each other as mates. The “soul” connection is the link to the lesson. And these lessons can be good and bad – what ever way, we have to work at it. So what I see in the “soulmate” connection is the universe giving me (us) its lessons, but in a way protecting me (us) by not giving not giving us false hope…. we give ourselves that.. hence the pain. Happiness is a state of mind – a place of contentment and stillness. All the money or love from another is totally worthless if we can’t open ourselves up to embrace the lessons of life. We continue looking for what’s not really there. I won’t give up on my friend – we are learning some valuable lessons between us, but I won’t allow my feelings for this man to divorce me from nature and truth. I have yet to find my “right mate” maybe I never will. I agree. I think soulmates are just people in our lives. It’s not destined or anything. If soulmates come and go, and friends come and go, and people in our lives come and go, no matter what the impact they had on us, the final result makes no difference. It’s all chance. People should stop making up things to comfort themselves and lull themselves into a false sense of security in their relationships instead of working out the truth. WRONG. Most people don’t even try or confront those problems. I find myself at a loss for words after reading your article. To say I feel devastated is an understatement. I have believed in ‘soulmates’ my entire life. Is the thought or notion of 2 souls meeting by destiny just a fairytale, really? I believe we have many ‘soulmates’ in one given lifetime. I believe simply, that a ‘soulmate’ is a soul that you have made an agreement with (before being incarnated) to help you learn a lesson or lessons. The chosen soul does not always appear as a husband or wife but can be one of many different relationship scenarios ie. brother, sister, friend, etc. Soulmate Debate: Are they real?